A Guide for Newcomers and Closet Pickers. By Peter Wernick. DVD/Instructional/Folk Instrmt. Bluegrass. DVD. Homespun #DVDWERJM21. Published by Homespun (HL.641558). ISBN 063405404X. 5.25x7.5 inches. Taught by Pete Wernick. 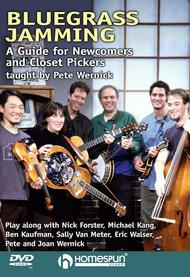 Pete Wernick created this “video jam session” so that novice guitar, banjo, mandolin, fiddle, Dobro or bass players of any level can get ready for the “real thing” by playing along with Pete and his exciting all-star jam band. The band runs through 16 classic bluegrass songs and instrumentals while Pete teaches the ins and outs of “jam etiquette,” the basics of music theory, how to make up harmony vocals, using the “number system” for calling out changes, and lots more invaluable advice. DVD EXTRA! Clicking the remote's “angle” button provides a close-up of the guitar player's left hand so you can follow the song's chord changes. 105-MIN. DVD • LEVEL 2 • INCLUDES LYRICS + CHORDS. March 07, 2010 Super product. This is a great DVD to play along with. You should know the "first position" chords (G, C, D, E). There's a strech into B. Very popular Bluegrass songs, good, ordinary players and singers. Great to "virtual" jam with and learn 22 standard BG songs. Definately 5 stars! 34 of 62 people found this review helpful.